The mechanical handset lifter HSL 10 by headset specialists Sennheiser Communications enables wireless headset system wearers to answer and end calls conveniently, even when not at your desk. The mechanical handset lifter, HSL 10, lets you automatically pick up or hang up the telephone handset, even if you are not at your desk. The HSL 10 is connected to a compatible base station, which is in touch with your wireless headset or system. By answering or ending the call on your wireless system, you send a command to the HSL 10 to raise or lower the telephone handset. Of course, it works within the entire range of your system's base station. What's more, the handset lifter can be trained to recognize the sound of your phone ringing, so that even if you are not close enough to hear it, the HSL 10 will. 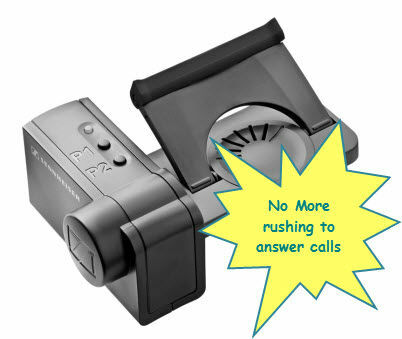 The intelligent gadget then passes the ring signal to your wireless system to inform you of the incoming call. Now that's convenient.